On our sixth day, we woke up early because the cold weather of the mountain gave us quality time of sleep. On our breakfast and planning of the day, we designated Manong Dinyo as the trail blazer because according to Jehson, he is the only person who has been to Brookes point using the locals’ trail. 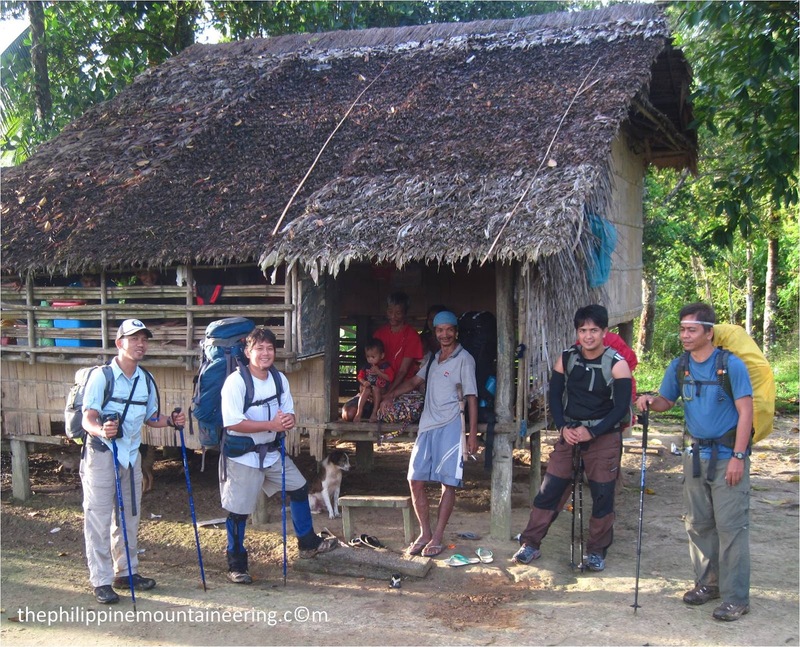 Thanks to Manong Dinyo’s effort because while we stayed in the camp for two days, he surveyed the trail going down to Brooks via Lapong. 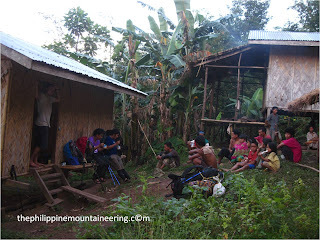 At first, my assumption was that it would only take us 3-4 hours of walking to reach the Sitio Lapong but I was wrong. The trail from summit to traverse is a big challenge for us. Due to being an uncommon place to most and even with the locals, the trail was full of moss and it was well vegetated. We experienced unpredictability of the trail. There was an incident on my part wherein I thought that I am stepping in a trail full of leaves but it was a cliff where leaves were covered of rotten log. It was a wonderful experience seeing myself moving 10 meters away from the trail. Thanks to Kuya Bong, he assisted me to be back on the trail. Truly, as I walk to the trail of Mantalingajan traverse the beauty and ecological presentation of Mt. Apo’s via Sta. Cruz trail was reminisced. We enjoyed our lunch in hunter’s kubo. The first day of the traverse was a great challenge for me and for my team mates because for more than four hours we just loose 300 meters above sea level of elevation. While resting, I keep on computing the elevation and possible distance, we still have to lose 1200-1500 meters above sea level for another day or two. We stopped for almost half an hour after Manong Dinyo cannot locate the trail going to Brooks Point. We reached a community and we felt relieved because some of the members were his relatives. The scenery within the trail were devastated, there were parts of landslide and soil erosion. We also saw parts of the mountain under illegal logging and kaingin works of the community. At 2:00 in the afternoon we reached Lapong. I was disappointed because I expected that there would be a community but there’s none. Lapong is only a junction where the trail from Kabgan community and the trail from summit meet. There is no community, we just sat and had a break while enjoying the moss covered trail. As I reflect, we were welcomed using green carpet. 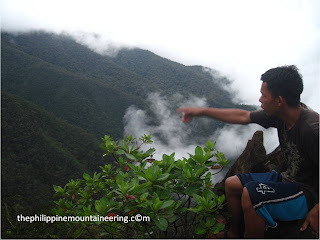 Manong Dinyo asked us to continue to walk after few minutes and told us “malayo pa ito,” what a pain for me, a local telling too far to reach the end point of the trail. At 4:30 in the afternoon Kuya Noel and Jehson convinced us to encamp in a vacant farm lot because it was a long day of walk for us and we have to rest. We tried to find some cassava o any root crops to cook but the wild boar consumed it all and left the farm area devastated. We asked Manong Dinyo if he knew the name of the place and he said “NO,” then kuya Noel told us to name the place for record purposes as Diki Camp (Diki for “di kilala”). It was a cold night for us. The water source was too far from us and we have only sufficient water to prepare our food. We cooked camote tops or “talbos ng kamote” from the farm lot. With the expectation that Brookes point was already near our camp, we cooked lots of viands. Our sixth night was also a rainy one. We decamp the following day at almost 9:00 in the morning because we have to dry our tents. We enjoyed the sunrise photo shoots and also contemplating the beauty of the trail. Our prayer for the seventh day was that it may be the last day of our long journey because our supplies can only cover our lunch. Manong Dinyo told us that Brooks Point is near and there is a sari-sari store where we can buy softdrinks. The sari-sari store was the focus of the team on the entire seventh day because according to Manong Dinyo there is a sari-sari store in Kamantian. It was a long walk. After seven hours of walking in a fast pace, we reached Kamantian, the place of sari-sari store. Immediately, we asked for some food because we only had our heavy breakfast and trail food. It was a terrible one, the moment we heard that the store was closed and the store owner is about to come from Brooks point. Thank GOD, the community was abundant with coconut. We bought coconut, I consumed three. Kamantian is the centre of Adventist mission works in Brooks point and some parts of Rizal. The Adventist mission operates a school for the natives. We had a quality chat with the missionaries and one of the blessings was the moment Elias Groft invited us to his house. Elias told me that he’ll cook some food for us and his place is the nearest trail going to Brooks point. Elias gave us cooked root crops and fruits in can. There we talked with the people of the community and learned from them the real name of Diki camp. According to them, the name of that place is Mataulay. It was a wonderful way of GOD’s provision. By the way, soft drinks were not available in Kamantian. From Kamantian, the aim of Manong Dinyo is to reach another sari-sari store because according to some locals in Bilang-Bilang, soft drinks are available there. We had to use our headlamps and be at N.A.R.R.A. that night because Kuya Noel’s flight will be on the morning. Ridge line crossing, night trekking and some river crossings were the highlights of our last day. We reached Bilang-bilang community at 8:00 in the evening and there we sipped soft drinks and asked the store owner to contact a tricycle that could bring us to Brooks proper. It’s a long serious day of walking and fighting our self comforts. The last trip of vans from Brookes to Northern part of Palawan (to N.A.R.R.A. and Puerto Princesa) is until 5:00 in the afternoon only. We huddled to the van drivers and their boss to bring us to Jehson’s place. It was an expensive one to have a private vehicle on special trip but we have to agree on their price. Along the way we took our dinner. While on our way to Jehson’s place we asked each other if we will back to the place with same itinerary. Most of the answers were no. Manong Dinyo told us that he will not go guiding on the same trail as well. Mantalingajan is wonderful mountain for me. I hope and pray that the mountain will not be devastated or exploit by human's greediness. As we traverse we saw lots of test pit for mining, have those is not illegal but the sad thing the test pits were within the 1200- 1800 meters above sea level elevation. I hope and pray that on my second climb to the wonderful mountain the forest line will recover from environmental crimes of kaingin and illegal logging. 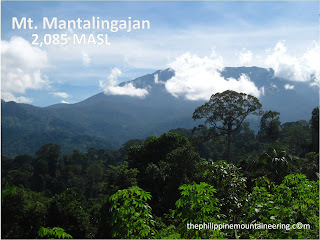 As of now, the itinerary for this Mantalingajan traverse is the longest climbing experience for me. 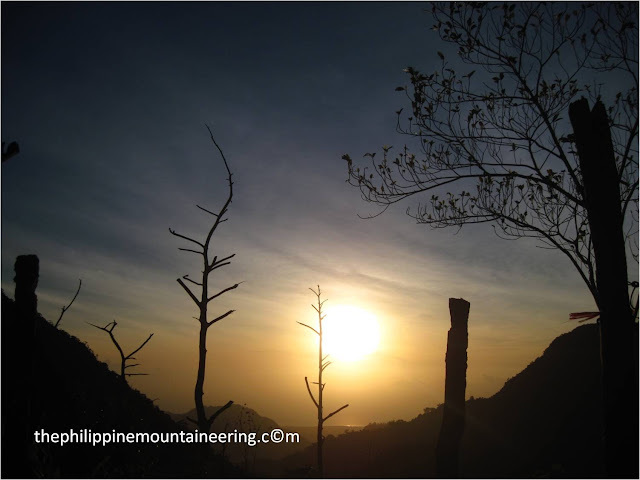 I hope and pray that more mountaineers will be challenge to climb the highest prominent of the province of Palawan. 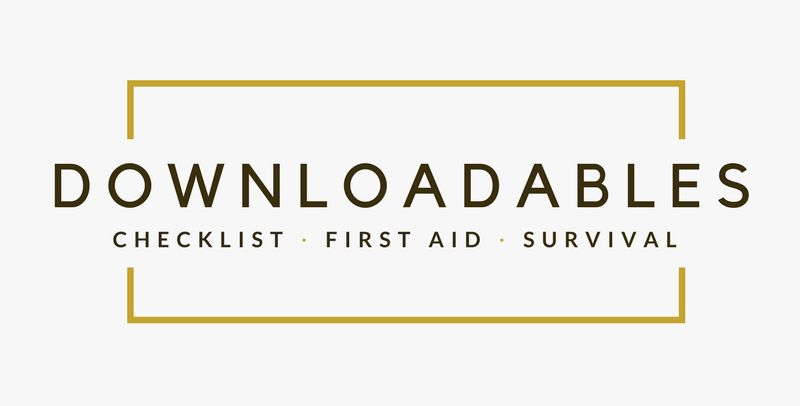 Kindly download the ideal itinerary for Mantalingajan traverse via Kamantian trail. Let us also support NO TO MINING IN PALAWAN. 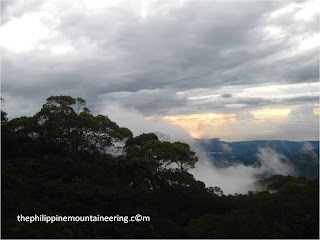 This site is very informative with regards to Philippine Mountaineering, as a beginner I have learned many stuffs regarding mountaineering, though I have not taken BMC yet, but this is as good as BMC I think. Thank you, keep this up! God bless! Hi there, its nice article about media print, we all understand media is a wonderful source of data.